On Saturday 27th September I took a nice stroll through the city of Zurich and along the lake towards where the Freestyle.ch event was being held this year. For those that aren’t fully aware, Freestyle.ch is a large event of around 30-35k people gathering in large cities, Zurich, Berlin and used to be London. It consists of a huge man made ‘Big Air’ structure being built for the snowboarders and skiers(yes they throw some snow on too), and 3 large dirt jumps for the FMX and Mountain Bikers. There’s also a huge area filled with hotdog bars, Red Bull tents, a skatepark, two rails with more snow on for those that bring their own gear and wish to show off their talent, and some other fun activities and top-brand stalls. But let’s concentrate on what I really went to see. The style show and actual competitions. These were awesome, the latter is pretty self explanatory – hit the big jumps and do the hardest and most technical trick you can. The Style show however was aptly named as this was all about tweaking out those smaller spins, and just looking as stylish in the air as possible. There were a few vets in the starting line for this event and it was great to see that even mid to late 30 year olds were still hitting this kicker with as much charisma as those who still need to get back to school on Monday. As for Sunday, this is where it all started kicking off. Within the first few warm up runs we had Roope Tonteri doing a Cab 1080 on his board, Gus Kenworthy puling off Switch Doubles on skis, big air backflips on the FMX and a DOUBLE BACKFLIP on a Mountain bike! It was awesome to see. 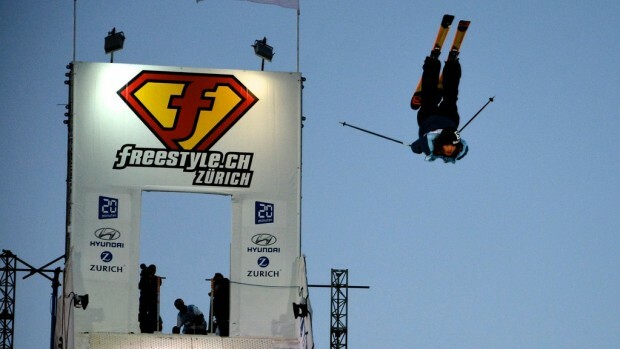 A few notable mentions would have to go down for Marcus Kleveland, the 15 year old snowboarder almost pulling off a triple, and Luca Schuler winning the ski event by stomping one! It was a great couple of days, and if I was to tell you about the partying….well we’d be here all night.